For the Muslim bride looking for inspiration for wedding cake designs, we have selected a few that have been inspired by various Muslim cultures. Please scroll down for the wedding cakes gallery for Muslim inspired cake designs. One of the things you look for as a bride during your wedding planning is the perfect wedding cake. Some brides go with the traditional gateau. Others go for something unique that will match their theme. 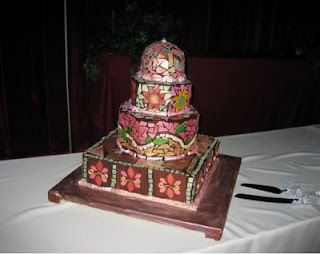 There is even the southern tradition of a groom cake. 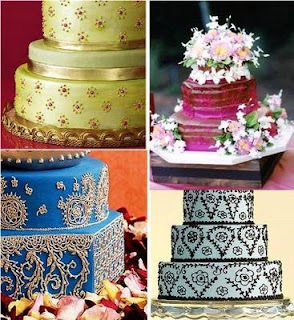 As you can see the ideal cake is different for each bride but then you really get into the details. 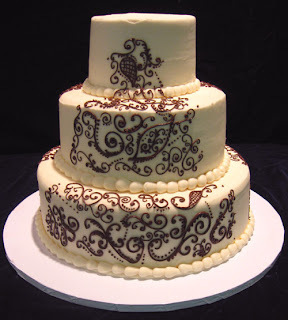 There is the icing, the cake design, and the flavor of the cake itself. As the fall season is fast approaching the big trend is the autumn wedding cake. However there are many ways to achieve this confection. Here are some interesting cakes that may inspire your choice if you are getting hitched this season. The all around perennial favorite is the chocolate cake. It is a classic that is very possible for it tempered sweetness and rich flavor. If you add on chocolate icing, the appeal trebles. Chocolate is popular during other times of the year but there is no other time it is more appropriate as a wedding cake as during the autumn and winter months. Chocolate is a deceptively simple confection and flavor as we think that it is quite limited in the way that it can be used. Funny enough, the truth is quite the opposite. There are several kinds of chocolate cake from German chocolate to chocolate mousse and the design options are quite varied. For the season try having the icing sculpted into familiar fall shapes like maple leaves and chocolate. The single color combined with these fun seasonal shapes produces a cake that is theme appropriate but gives an impression of understated elegance. An interesting new trend is fall cake toppers. You can have the traditional groom and bride with a fall twist. The most obvious takes advantage of holiday motifs like Halloween or Thanksgiving. An interesting new trend is to go atypical using confections shaped like popular fruit like apples or pears and fall vegetables that are harvested like squash, pumpkin, corn, or even wheat. The result it sumptuous to look at and gives a cake a unique flair that sets it apart from its more traditional cousins. Another interesting trend is the use of icing and confectionary decorations on fall wedding cakes. In short it is simply amazing. Cake makers are now making their creations into edible art recreating scenes of fall in all their glory. This is great for the bride wanting something that is one of a kind. For example the icing and candy is used to depict the branch of a tree with a full complement of realistic fall leaves and even wild life such as birds. This creates a truly dramatic cake. The truly amazing ones take it a step further by making the scenes or fall shapes 3D. One that I recently observed was designed to look like a pile or artfully arranged fall leaves sticking out from the basic architecture of the cake. The bold bride can go even further for the perfect autumn cake by using seasonal flavors such as carrot cake, sweet potato, or even pumpkin. Done right by people with the proper know how this produces case with delicious and unique flavoring that will surely be remembered by guests. You can also go for more tame varieties like ginger, or spice cake. Andrea McClure has authored on an extensive range of topics related to the wedding industry. If you are looking for Wedding Cake Toppers, Mrsweddingfavors has the biggest selection available. You will also find Wedding Favors and much more, all at very affordable prices.